Trick out your ordinary pickup truck! Whether on the market for one or a fleet, people are asking for more from their trucks nowadays including a mix of functionality and good looks. If you are so inclined, you can get a lot of personal satisfaction and you can improve your image by changing the look of your pickup with a variety of useful and attractive accessories and add-ons. If you are going to customize your pickup truck one place to start is with the hood. Hoods with scoops are functional. Cool air from outside the engine compartment is brought in and they are able to increase horsepower and increase throttle response. Systems include a washable, five-layer filter providing the ultimate balance of maximum airflow and maximum filtration. Custom wheels are one of the most frequent ways in which car enthusiasts of all ages customize their vehicles. Adding custom rims can add a unique look to a pickup's overall appearance but can also add to a pickup's performance. If you want to make an immediate impact on appearance then look for the shine in chrome wheels. But polished aluminum wheels look good too. Black custom rims are a new hot style now seen on small tuner cars. Plus there are many other colors to choose from that will match your pickup. One pracical benefit is that you can increase your gas mileage as well as getting better performance. This is due to the reduced weight offered by custom alloy wheels. It's about the interior look and giving it an uplift. You can give your truck the rich look of gauges that are white by day and glow at night. This luminescent technology can now transform the inside of your cab. Your dashboard will have the look and style of a modern and stylish automobile. You can add a full frame light bar mount to existing windshield hinges using existing holes. This will allow you to connect up to four off-road lights. These include chrome taillight covers, door handles and mirror covers. Get them because any of these will give your truck a snazzy look and feel. The materials are designed to address the rigors of the elements and they match other automotive chrome perfectly. You can add chrome door handles, mirror covers and headlight covers. These are for your license plates. The light wing mounts to almost any bumper that has a solid mounting area for the vehicle's license plate. The light wing is universal; most vehicles do not require a special mounting kit. So adding it will be easy. And the unique style easily accents your truck's appearance. If you want to add special things to your cab, the cab top light mount is just for you. You can mount lights, an antenna, speakers, utility and any other exterior electronics easily in minutes with no need to drill unnecessary holes in your truck cab. They provide a custom look and are good for security. Most covers feature a push-to-open door which operates like a locked door. All are available in several finishes. These are custom-molded attachments that fit securely into the wheel well openings of trucks, Jeeps and SUV vehicles. 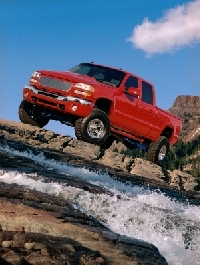 You can customize your pickup while not going to the expense of adding side body modifications. Fender flares add body side styling. They are good environment guards that keep mud and road debris off the vehicles. Your tires can get additional coverage even when using wide or tall tires. Overall the fender glares can let you customize your pickup truck and improve the truck's overall image.